This December 13, 2017, the Richardson Police Officer's Association Fraternal Order of Police Lodge 105 will host its 5th annual COPS & KIDS Christmas Shopping Event at Walmart to spread "Yuletide Cheer" to underprivileged children in our community. As this signature charity event, our members actively support the community we serve and assist those who need extra help during the holiday season. 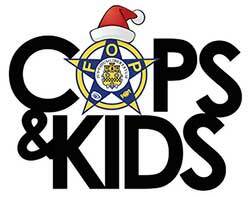 At the COPS & KIDS event, each child will be paired with a uniformed member of the police association who will assist the child while shopping for $150 worth of gifts. Our members' continued support, both financially, and with their time, remains a powerful example of the noble men and women in the policing profession today. We have the distinct privilege of hosting 30 children this year. We are proud to partner with Walmart, which supports organizations that share its philanthropic mission to keep kids safe and provide assistance in times of need. We also could not put on an event of this magnitude without the help and support of the Richardson Fraternal Order of Police Auxiliary, the Texas Municipal Police Association, and our business and citizen sponsors.